I just might be in the throws of the slowest and most preventable death in history – death by Netflix. We nearly ended out subscription earlier this summer as a way to save a few bucks in the summer. We weren’t using it much, anyway, especially after Yo Gabba Gabba!, Dora and other kid favorites were eliminated from the catalog. But then Arrested Development made its long-awaited return. And Orange is the New Black debuted. And, now, I’ve gotten into House of Cards. Oy. Big news over the weekend. We finally got an answer to that who killed John F. Kennedy thing that’s been bothering us for nearly 50 years. Reelz — the network that’s the future home of Hollywood Hillbillies and, according to Wikipedia, runs a program called Movies That Deliver, which Domino’s sponsors — claims to have proven what Jim Garrison, Oliver Stone and millions more believe: Lee Harvey Oswald didn’t kill JFK. Oswald shot the president, Reelz says, but the fatal shot came from the gun of Secret Service agent George Hickey, who accidentally killed Kennedy. Reelz will explain this in an upcoming documentary, JFK: The Smoking Gun. The claims about Hickey, who died a few years ago, aren’t new. A 1992 book made the argument but Hickey sued. Two years ago, Bill James championed this idea in his Popular Crime book, although others pointed out some of the flaws in the argument. John Meyer paid a pretty penny for these bad boys. And he’d do it again. 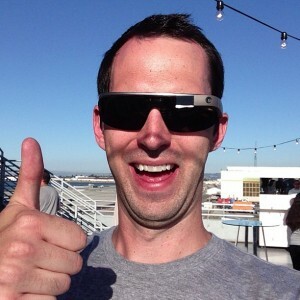 Google Glass could be the next big thing … or a historically funny moment in fashion. Either way, it’s different enough to be interesting. That’s the topic of this week’s TVFury podcast as Sioux Falls businessman and Glass adopter John Meyer tells TV – and a random panhandler – how his experience has been so far with the new piece of technology. Seriously, hang with the conversation long enough for the strange interruption. Here’s the link. Oh, and forgive the lack of intro and outro music. That’s what happens when TV tries to function after drinking a beer. This week’s links take you around the world. Probably. * Zach Lowe on the winners and losers this NBA offseason. He was not impressed with the Lakers. * Forget the NBA Dunk Contest and enjoy the theatrics at the Venice Basketball League dunk contest. * Brittany Griner on adjusting to the WNBA. * Usain Bolt on why he can be trusted when it comes to doping. * Wait, Alex Rodriguez is a slumlord too? This guy. * I’m not on Gmail. Yahoo! baby. But friends who are have hated the new tabs on Gmail. Of course, Slate — being Slate — says the tabs are the best thing ever. * Michael Bamberger on how Tiger Woods’ major drought can be traced to his lack of aggressiveness. In another Tiger piece, Jason Sobel on the difference between Phil Mickelson and Tiger and how their personalities lead to different results when they’re trailing in a major. Here’s my issue with Sobel’s piece: Even with this swashbuckling attitude that makes it easier for him to rally than Tiger’s oh-so serious play-it-safe persona, Phil didn’t rally after 54 holes at a major until he was…39 years old. The 2010 Masters. It did nothing for him in coming back until he was two years older than Tiger is now. So is it really a better way to attack? Damn it, Tiger, win a major. * Jay Caspian King on Reddit and the spreading of a smear during the Boston bombings. * Slideshow! The 25 best action movies since Die Hard. * Turns out a former New York Jets receiver and aspiring writer wound up living in Sioux Falls and working at a grocery store after his playing days. The New York Times has the story. * CNN believes that the HBO show The Newsroom – much mocked and much watched – matters because it expresses idealism that could be important to the future of journalism. That doesn’t mean we have to like Maggie Jordan, right? I’ve only hated one athlete in my life, and hate isn’t even the right word, since I’m only talking about it in the sports sense and only from the perspective of a shattered 9-year-old. M.L. Carr. In June 1984 as Carr waved his white towel and incited the Boston Garden crowd and came up with a big steal to seal Game 4 of the 1984 Finals, I hated him. Why wouldn’t I? I thought he’d ruined my childhood. That went away, though, and now I look back fondly on Carr’s antics. He’s part of what made the Celtics-Lakers rivalry so great. I also enjoyed his reign with the Celtics as they disappeared into irrelevancy in the 1990s, but later I learned he’s pretty much a great guy — does outstanding charity work, helps the community. Nothing to dislike, much less hate. To be clear, I’m not sure what Milwaukee Brewers slugger Ryan Braun took to get a rest-of-the-season ban – whether it was illegal or just against the rules of baseball. If it was the latter, well, then I can relate. I thought I’d be writing about Tiger Woods failing to win the British Open and how it absolutely doesn’t mean he’s going to go majorless for the rest of his career and that I’m still willing to place money on the belief he’ll tie or break Jack Nicklaus’s record of 18 major championships. But I figure I’ll break that one out after the PGA Championship when he finishes seventh, four shots out of the lead. Instead a look at how ESPN, NBC and CBS cover golf, from someone who’s not a TV critic and doesn’t know exactly how to operate a DVR but makes up for it with insightful golf expertise drawn from years of hitting wayward tee shots, when they’re not simply skidding on the ground 40 yards in front of me. While Naw’lins it ain’t, Sioux Falls is the home to a respectable – in terms of music and attendance – JazzFest each summer. The latest edition wrapped up Saturday night with an estimated 60,000-70,000 people checking out headliner Sheryl Crow at a soccer complex located near the Big Sioux River. It’s time for the links. Print them out and use them to fan yourself. * Great story on Jack Handey, who’s the envy of every comedy writer in America. * Grantland celebrates Jeff Bridges — although not his new movie — with a YouTube Hall of Fame tribute. Wish there would have been some Jagged Edge action, though. * From the LA Times, the tale of a man who has the signatures on 2,913 Sports Illustrated cover subjects and his quest for an unnamed model on a 1960 issue. And the sad followup. * New York Magazine on the controversy over Rolling Stone’s cover with the Boston Bomber. * Fun piece from Patrick Reusse on nine lost traditions from baseball. * Drew Magary on how America is ruining Johnny Manziel. * Wright Thompson on a search for family history in Scotland. * The Boston Globe on what life inside the joint is like for ex-Patriots tight end Aaron Hernandez. * Grantland is in on the new Netflix show “Orange is the New Black.” TV is, too. * Remember when TV did some extra work in a video? Here is the final product. I want to say the Fury family got its first VCR in 1987. Must have been ’87, because that winter I remember watching The Drive For Five, a recap of the Lakers title that I ordered in the mail. Chick Hearn narrated. From my earliest days I possessed unnatural quickness in programming a VCR. If a program was beginning in 30 seconds, I could go through the programming menu without even looking, my hands dancing on the remote, my fingers knowing exactly where to go. Hit the record button only? For amateurs. In 26 years since I recorded thousands of hours of programming. It changed when the cable box went digital and I had to actually have it on the proper channel to record — no more setting it for one channel and watching another at the same time. Last thing I recorded? Game 7 between the Heat and the Spurs.